7 nights accommodation in a 1 bedroom luxury fully equipped apartment (1 bathroom) at the Residences Mar Menor Village (all rooms with twin beds) with breakfast daily (limited buffet) at the clubhouse, and 5 green fees on your choice of Alhama Golf, Saurines Golf, El Valle Golf, La Torre Golf, Mar Menor Golf and Hacienda Riquelme Golf. Free shuttle to/from golf courses (1 Feb-31 May/19). Early Booking discount available for booking more than 60 days in advance. This will be automatically calculated for you. 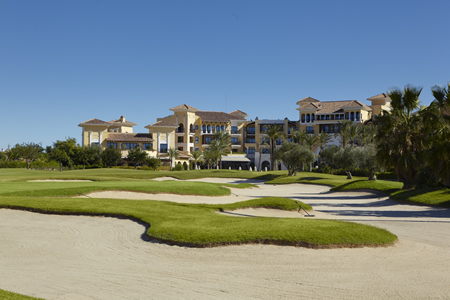 The Residences at Mar Menor are brand new apartments in the heart of the Mar Menor Golf Resort... which means doing what you really want to do, it means tranquility, sun, beaches, fine cuisine, sport, fun… At the Residences you will enjoy family holidays the way you like them. 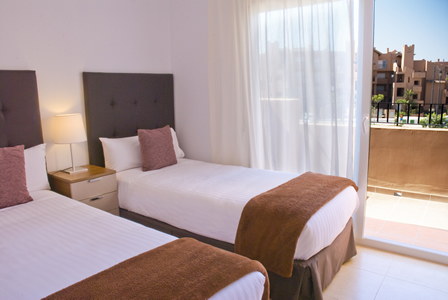 Feel at home, but without giving up the comfort and services of the best hotels. 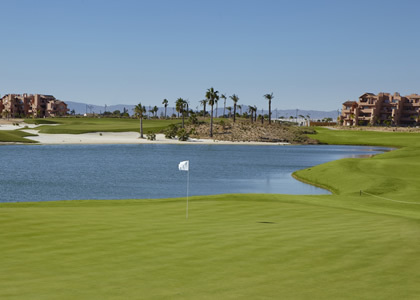 Choose a weekend break or stay as long as you like, of course, you will have access to all the services provided by Mar Menor Golf Resort, Intercontinental Mar Menor and Murcia Golf Experience. There are also infinite ways to enjoy your free time, including: golf, the spa, shops, bars, restaurants, terrace bars, sports facilities and a long list of activities designed to keep the whole family entertained. And all this in Murcia, a region with one of the mildest climates in the Iberian Peninsula. 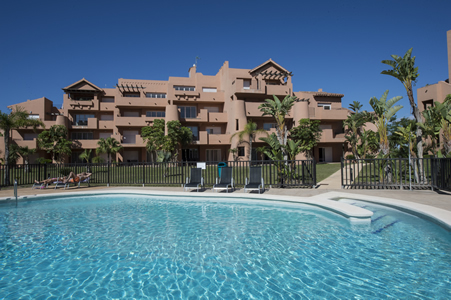 The resort enjoys fantastic natural surroundings and is close to the best beaches of the Mar Menor as well as being only a few kilometers from the cities of Murcia and Cartagena. 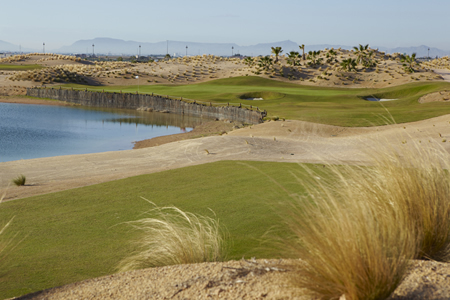 Especially recommended for: couples, foursomes, families, golfing groups. These luxury apartments leave no details to chance, They have a beautiful and bright living room, fully furnished with modern and comfortable furniture. Fully equipped kitchen and full bathroom. 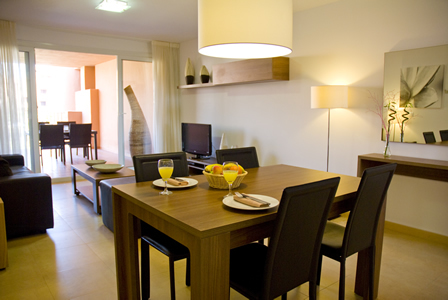 1,2 or 3 bedrooms, terrace or garden, communal swimming pool, all of them overlooking the golf course and beautiful lakes. The complex offers top level facilities and services with a 5 star Intercontinental Hotel and its facilities: spa, swimming pool, restaurants, Proshop and cafés; an 18 hole golf course designed by Nicklaus Design; sports facilities, Social Club with cafés, swimming pool, restaurants, supermarket, cash dispensers, bank, etc.
. Nomad Restaurant - Mediterranean cuisine on the magnificent terrace.
. Al Fresco – Pool Restaurant with a fresh variety of sandwiches, salads, burgers….
. El Olivo: Bistro Restaurant. The best selection of salads, tacos, paellas...etc and everything by the pool. touches studio the 1100m spa also has a 15 meter indoor heated pool and a state-of-the-art fitness studio. Groups must make spa reservations in advance.